Pioneering early Berlin rock, jazz, electronic and experimental music label. Ohr is well known as one of the key labels of the Krautrock scene. 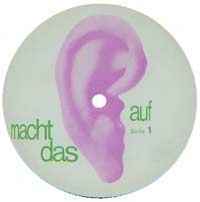 Established by producer Rolf-Ulrich Kaiser and Hansa founder / Metronome executive Peter Meisel, it also spawned the Die Kosmischen Kuriere and Kosmische Musik labels. The first Ohr LP was released in April 1970. The final release was completed in December 1973 (released early 1974). In this time, they released 33 albums (four of which were double LPs) and twelve 7" singles. Ohr and its partner labels: Kosmische Musik and Pilz (2) ran into difficulties with litigation raised against the company by some of its signed artists, causing the seizure of all assets and shutting down of Ohr and related labels in 1975. The label archives were stored at Dierks Studios's vaults, some rights were assigned to Metronome (with further re-releases on Ohr or Brain), and later on some releases (whose rights had not reverted to the original artists) were licensed out via partners of Dieter Dierks' own Venus Records GmbH. The next 12 single LP releases had 6 digit catalogue numbers. OMM 556.017 to 556.033. Originals of OMM 56.000 to 556 017 had no matrix numbers on the label. Later editions of the first 17 LPs also had 6 digit: 556.### catalogue numbers (see Reissues). 7" singles had catalogue numbers: OS 57.000 to 57.012. The first 5 LPs had uniformly designed sleeves by Reinhard Hippen (of which first editions showed a hatch on the front sleeve for an included balloon). Many others also came with novelty sleeves, and some with inserts or posters. LP 556.026 and 7" OS 57.010 were never released. Most 556.### LP reissues of originally 56.### releases date from 1972 to 1974. 1980s+ Many Ohr LPs were reissued by BERNHARD MIKULSKI Schallplatten-Vertriebs-GmbH, often with original cover and label artwork. These can usually be recognized by the "Pop Import" logo and address on the cover. For some more popular titles many different pressings exist (often with different labels like PDU, Die Kosmischen Kuriere or black Cosmic Music labels). Some also have a 3-phase circle logo (meaning unknown) and Venus Records logo. Later ones: end of 1980s and early 1990s (now with Mikulski trading as ZYX Music) redesigned the logos again, and a few appeared as budget issues in single sleeves. 1990s Think Progressive issued a few titles as heavy vinyl, and Spalax in France issued many on CD (first issues often with Ohr logos), and two also appeared on Repertoire Records CD. ZYX Music also issued CDs in Germany, first circa 1992 to 1994 with OHRCD numbers, and 1999+ (CD and LP) reissues all featured the following 4 logos: Ohr, Pilz, Ohr Today, Die Kosmischen Kuriere. It is customary to list all these logo/labels on Discogs. Label Code: LC 2127 (Ohr and other labels owned by Bernhard Mikulski GmbH and/or ZYX Music 1978 or later). Ohr Today was a label established by Dieter Dierks and Bernhard Mikulski GmbH in 1982. Documenting labels via the logos and working out what are company names can be complex on Discogs. Basically, if it has an Ohr logo then list it and all other label brands. Identify distributors, publishers and marketing and add as appropriate. If in doubt compare other similar releases already on Discogs. An enhanced quote from "The Crack In The Cosmic Egg" CD-Rom, first posted on my Krautrockers group here on Discogs. Release dates from: Rock In Deutschland (Taurus Press, Günter Ehnert 1975) correlated with other sources.